Eight openly LGBT candidates have won their races for the U.S. House and one will head to a recount. Either way we are assured a historic number of openly LGBT candidates will be in the U.S. Congress next year. Three of the LGBT candidates won seats currently held by Republicans. One was in a key swing district held by a retiring Democrat, and four were incumbents. U.S. Senator Tammy Baldwin won a resounding reelection to the U.S. Senate from Wisconsin. Kyrsten Sinema’s race for U.S. Senate in Arizona remains too close to call. Sinema has expanded her lead over GOP Rep. Martha McSally in Arizona after another day of ballot-counting in the state. Sinema stretched her lead to 28,688 votes on Saturday evening as officials in the two most-populous counties, Maricopa and Pima, counted tens of thousands more absentee ballots. It is expected that the margin could shrink slightly when smaller counties where McSally has an edge report new totals. Sinema now has 49.5 percent of the vote to McSally’s 48.2 percent, with hundreds of thousands more votes still left to count. LGBTQ Victory Fund raised more than $235,554 for its endorsed LGBT U.S. House candidates and more than $366,000 for its U.S Senate candidates this cycle. Gina Ortiz Jones’ race for the U.S. House from Texas will head to a recount. Rep. Will Hurd, R-Texas, was initially declared the winner. But Ortiz Jones early yesterday moved into first place. A subsequent error in the vote count put Hurd, former CIA operative and one of two black Republicans in the House, back in the lead by 1,000 votes later in the day. A recount seems a foregone conclusion. Currently there are six openly LGBT members in the U.S. House and one openly LGBT U.S. Senator. Twenty-two openly LGBT candidates won Democratic or Republican primaries for U.S. Senate or U.S. House this year. That is more than at any other time in U.S. history. The number of nominees is a 29 percent increase when compared to the 2016 election cycle, and a 340 percent increase since 2010. For the latest results, visit victoryfund.org/results2018. Overall Tuesday night, openly LGBT candidates picked up three new seats in the U.S. House: Angie Craig in Minnesota, Chris Pappas in New Hampshire, and Sharice Davids in Kansas. All three were the first openly LGBT candidates to win election to Congress from their states. U.S. Rep. Jared Polis won his historic bid to become governor of Colorado and the first openly gay man to be elected governor of any state. Voters also welcomed three new lesbian mayors: Teri Johnston in Key West, Besty Driver in Flemington, N.J., and Julia Fahl in Lambertville, N.J. The vast majority of more than 100 openly LGBT candidates for state legislative offices won. In Massachusetts, voters soundly voted “Yes” to retain a state law that prohibits discrimination based on gender identity in public accommodations. It is the first statewide vote on such protections. 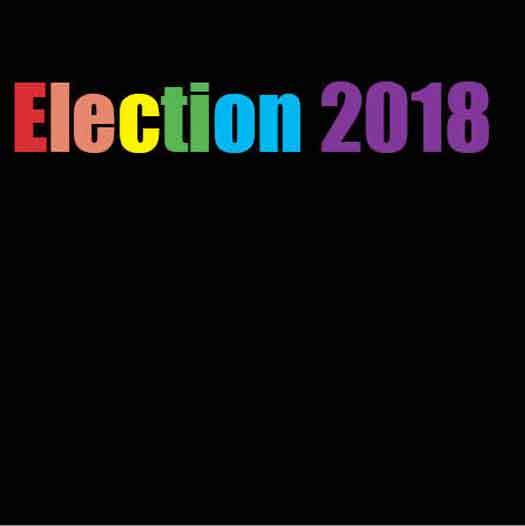 There were not “blue waves” in every state this mid-term There were some disappointing losses for the LGBT community and the Democratic Party. Transgender Democrat Christine Hallquist fell short in her bid to unseat Vermont’s Republican incumbent Governor Phil Scott. Green Party candidate Paula Overby in Minnesota and Independent candidate Brad Peacock in Vermont lost their bids for U.S. Senate seats. But, the four incumbent LGBT U.S. representatives running for re-election all won: David Cicilline in Rhode Island, Sean Maloney in New York, Mark Pocan in Wisconsin, and Mark Takano in California. The newcomers, mentioned previously are Chris Pappas from New Hampshire, Sharice Davids from Kansas, and Angie Craig from Minnesota. There were four openly LGBT candidates for governor Tuesday night. Incumbent Democratic Governor Kate Brown of Oregon won re-election with a five-point margin. And U.S. Rep. Jared Polis won with a six-point lead over his Republican opponent. Both losing LGBT candidates for governor earned strong support at the ballot box, despite coming up short. Christine Hallquist, a state energy activist who became the first transgender candidate to win a major party nomination for governor. She had a robust 40.5 percent of the vote but was ultimately beaten by popular Republican incumbent Governor Phil Scott in Vermont. And Lupe Valdez, a former Dallas sheriff, won 42 percent of the vote against popular Republican incumbent Governor Greg Abbott in Texas. Voters in Massachusetts did not vote as strongly to keep a transgender non-discrimination law as polls had predicted. The latest poll predicted 74 percent would vote to retain the two-year-old law. But, with 82 percent of the vote in, 68 percent voted “Yes” on Question 3. The vote will ensure the law would remain intact. “By winning the first statewide popular vote on transgender rights, Massachusetts voters reaffirmed our Commonwealth as a place that fiercely defends our basic values of dignity and respect for everyone,” said ACLU Massachusetts Executive Director Carol Rose. Question 3 in Massachusetts marked the first-time voters statewide had been asked to vote on whether state non-discrimination laws should prohibit discrimination based on gender identity. There were at last count 101 openly LGBT candidates in races for state legislative offices on Tuesday. They included: 85 state house or assembly seats and 16 for state senate seats, in a total of 26 states. Of the 85 running for state house seats, 62 won, 18 lost, and five are still in contention with recounts. Among the many “firsts” recorded Tuesday, Megan Hunt became the first openly LGBT candidate elected to the Nebraska state legislature. The largest field of LGBT candidates ran in Texas (10), followed by Ohio (8), and Georgia and Washington (6 each). Massachusetts’ lesbian Attorney General Maura Healey coasted to re-election victory Tuesday night, winning 71 percent of the vote and fueling expectations that she will make a bid for governor in 2022. As a newcomer in 2012, she won with 62 percent of the vote. The U.S. Pacific island of Gaum elected an openly gay Lieutenant Governor, running mate to its first woman Governor Lou Leon Guerrero. And Texas Libertarian candidate for lieutenant governor, Kerry Douglas McKennon, came in a distant third, with less than one percent of the vote.